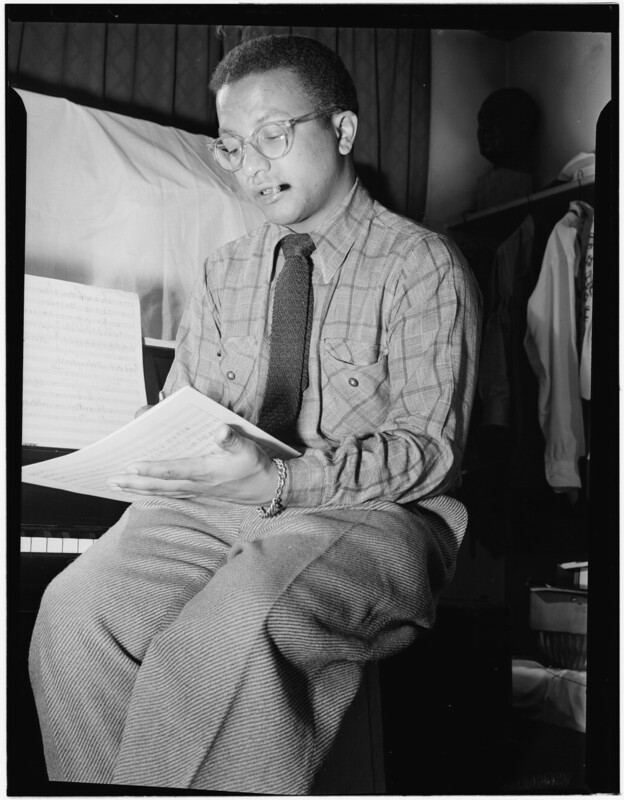 “Billy Strayhorn was always the most unselfish, the most patient, and the most imperturbable, no matter how dark the day….” (Duke Ellington) Photo: Billy Strayhorn circa 1947; William P. Gottlieb Library of Congress Collection, public domain. I hope you’ll indulge me as I do something a bit different for today’s post. It’s still about kindness—one of the kindest people who ever lived—but it’s also a celebration of a life, and of music that will endure for generations. The composer of this song—music and lyrics—was the incomparable Billy Strayhorn, and this month we celebrate the 100th anniversary of his birth. It’s likely to be overshadowed by the 100th anniversary—less than two weeks later—of the birth of a much more famous musician: Frank Sinatra (who, incidentally, agreed that Lush Life was one of the most perfect songs ever written). But give me Billy any day. In fact, give me Billy every day. In addition to being one of the most talented composers and musicians who ever lived, he was extraordinarily kind. It may have been his kindness and self-effacement that prevented him from becoming as famous as Sinatra or any of the truly celebrated musicians of his day. He just didn’t care all that much for fame, and he only wanted to compose, play the piano, and work with other great musicians. Sadly, he also died much too soon, at age 51 from esophageal cancer. If you can’t place the song, check out a few of the greats who have performed it. The very best is the 1963 recording by Johnny Hartman with John Coltrane (one of the best jazz records ever!). Sarah Vaughan, Nancy Wilson, Andy Bey, Chet Baker, and countless others also sing Lush Life, including a lovely film version by Queen Latifah. Did I mention that Billy Strayhorn was only 17 when he wrote this very sophisticated and world-weary song? If you know of Strayhorn at all, it’s probably because he was Duke Ellington’s musical partner and collaborator from 1939 to Billy’s death in 1967. Many of the songs and albums attributed to Ellington—who was certainly a genius in his own right—were written by or written with Billy Strayhorn, often without credit to Strayhorn. Theirs was a synergistic relationship: Ellington was the extrovert, Billy the introvert. Ellington sought the limelight, Strayhorn prized his privacy. They knew each other’s musical minds inside and out. Some of Duke Ellington’s most famous songs were by Strayhorn. Take the A Train—the song that became the Ellington band’s theme-song was composed by Strayhorn from subway directions Ellington gave Billy to Duke’s home in Harlem. Satin Doll, considered Ellington’s most recognized song, was also among the estimated 500 songs Strayhorn wrote alone or with Duke. Their versatility extended to stage shows, movie soundtracks, sacred music, and even a celebrated version of The Nutcracker Suite. Often even they weren’t sure who wrote what parts—that’s how seamlessly they collaborated. If you like jazz, there are numerous songs you’d recognize that are Strayhorn compositions: Chelsea Bridge, Lotus Blossom, Something to Live For, Passion Flower…. Strayhorn’s roots were in classical music—you can hear it in many of his compositions—he originally intended to be a classical concert pianist … until he heard the likes of Art Tatum, Teddy Wilson, and Duke Ellington. But he carried his classical training with him when he turned to jazz. Strayhorn’s actual 100th birth-date is November 29. I’m posting this now in hopes that you live in an area where you might have access to some of the Strayhorn centenary concerts. There will be three here in the Seattle area, performed by the Seattle Repertory Jazz Orchestra on November 7 (Seattle), November 8 (Kirkland), and November 9 (Edmonds). Oh, yes, we’re going! There will also be celebrations in New York, Chicago, New Jersey, Philadelphia, Pittsburgh (where Strayhorn was born), New Orleans, Portland, OR, London, Paris, Italy, and undoubtedly other places. David Hajdu, author of the definitive and completely absorbing biography of Strayhorn, aptly titled Lush Life, is going to be in Seattle during our Strayhorn celebration. Perhaps he’ll be in other cities later in the month. I recommend his book to anyone who’d like to know more about this remarkable man. I can’t possibly do him justice in a single blog post. Duke Ellington and his band recorded a tribute album entitled “And His Mother Called Him Bill” only three months after Strayhorn’s death. It is considered one of the very best Ellington recordings, and the playing by saxophonist Johnny Hodges—a good friend for whom Strayhorn wrote and arranged many songs—is sublime. Beyond being a musical genius, Billy Strayhorn was supremely kind and generous. He coached countless musicians to improve their craft and often wrote music just for them to maximize their talents. As an openly gay African-American in the mid-twentieth century, he faced plenty of prejudice, yet always maintained his gracious demeanor and optimism. “Ever up and onward” was his catch-phrase. He was committed to the civil rights movement and a close friend and confidant of Dr. Martin Luther King, Jr. He viewed everyone equally and found something to appreciate in everyone he met—from a waitress in a diner to the Queen of England. He did not have a bad word to say about anyone. Some of Billy’s friends referred to him as “Buddha,” in recognition of his ability to be completely present with everyone he encountered. And don’t forget to see if there’s a 100th birthday tribute scheduled anywhere near you. If not, you can make your own. Happy birthday, Billy … and thank you!